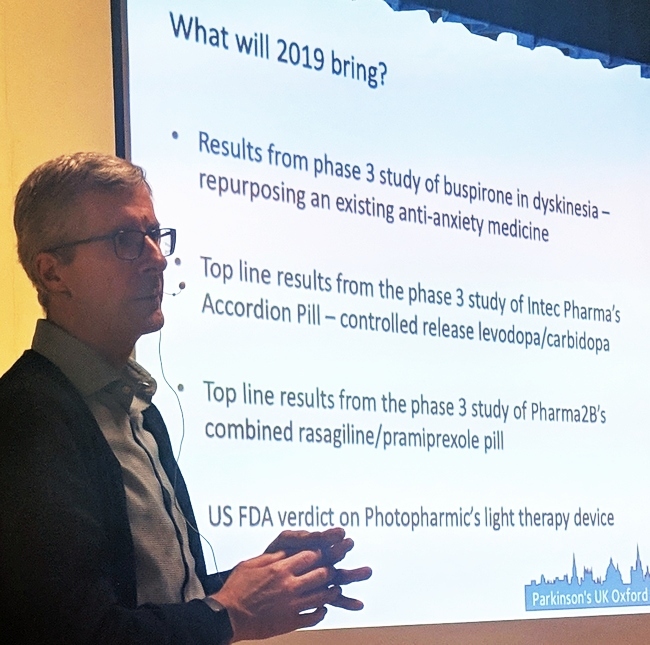 At our January 2019 meeting, Kevin - who is our Branch committee member tasked with keeping us up to date with research news - presented his survey of new therapies that have made it out of the research laboratory and are now in development or trial by pharmaceutical companies. A little further down this page you can see a 44-minute video of the presentation slides, as they were shown on the screen, and Kevin's talk along with the question-and-answer session that followed it. Alternatively you can see it on Vimeo at this link. You can also download the presentation as a PDF document (6MB) using this link. At the end of the document you will find additional slides describing therapies that the talk mentioned but did not explore in detail.